olusi University, located 50 kilometres west of Bulawayo, Zimbabwe, is a co-educational institution, which was founded in 1894 as one of the first of the hundreds of Seventh-day Adventist mission stations. It was named after Chief Soluswe, near whose home the Mission was founded. During the first decade of its existence, Solusi Mission shared in the suffering brought to the region by war and a resulting famine. Despite these hardships, the development of the Mission continued and a regional training programme was established for the development of church workers. Men who trained at Solusi Mission assisted in the development of new mission stations on other parts of, by then, Southern Rhodesia; and several of them reached beyond the borders of the country to help establish mission schools in neighboring countries as early as 1905. With a growing demand for church workers, Solusi Mission continued to expand, and by 1929 a government approved teacher-training programme had begun. To meet the need for higher academic training, secondary school training was begun in 1948, and in 1952, the teacher-training programme was moved to Lower Gwelo (Gweru) Mission to make room at Solusi for the expanding academic programme. On October 31, 1956, the Board of Regents of the General Conference of Seventh-day-Adventists authorized the upgrading of Solusi to senior college status. 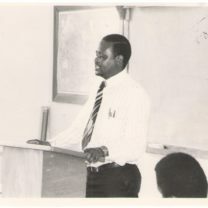 By 1958, Solusi College was offering post-secondary course leading to Bachelor’s Degrees so that church workers throughout Southern and Central Africa would be more fully qualified to meet the leadership challenges of an increasingly sophisticated and more highly educated church membership. To enhance the quality of the programme and to facilitate acceptance for postgraduate studies at international universities, negotiations were promptly begun to achieve affiliation with a fully accredited Seventh-day Adventist university in the United States of America (USA). 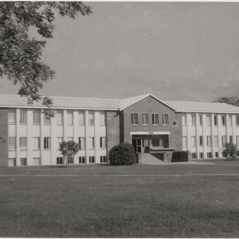 By October 1984 approval for an affiliation with Andrews University in Berrien Springs, Michigan had been granted by the Solusi College Board of Trustees, the Andrews University Board of Trustees, the Board of Regents of the General Conference of Seventh-day-Adventists, the Board of Higher Education of Seventh-day Adventists and the regional accrediting body in the USA – the North Central Association of Schools and Colleges (NCASC). This affiliation between Solusi College and Andrews University was a contractual agreement under which Andrews University undertook a continuing process of review of the Solusi College administration, teaching faculty, library and other physical facilities. Under the terms of the affiliation contract, Solusi College was obliged to underwrite all expenses related to the affiliation, and to maintain internationally accepted standards for its faculty and its academic policies, including adequate faculty, facilities, equipment, and appropriate admission standards and examination procedures. For its part, Andrews University agreed to provide guidance in the development of new programmes, to monitor academic standards and examinations, to grant academic credit for all courses satisfactorily completed in approved Associate or Baccalaureate Degree programmes, and to confer its degrees upon the students who satisfactorily completed ALL degree requirements as specified by the faculty of Andrews University. The Registrar of Andrews University accepted the ongoing responsibility of issuing transcripts whenever required by the graduate, appropriately identifying the Solusi College campus as the location where the degree requirements were completed. Solusi College developed rapidly under the 10 years of affiliation with Andrews University. New programmes were added and enrolment increased by nearly 500 percent. In 1987, 1993 and again in 1998 Solusi University, as a part of the worldwide Seventh-day Adventist educational system, received denominational re-accreditation as an institution of higher learning following thorough inspections by teams of regional and international educators representing the Accrediting Association of the General Conference of Seventh-day Adventist Schools, Colleges and Universities. 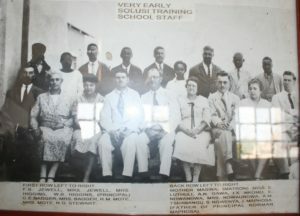 On all occasions, Solusi educators reciprocated by participating in inspections of sister institutions in East Africa. 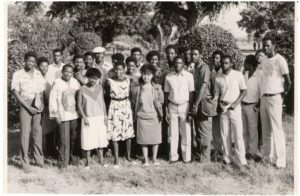 In 1991, subsequent to the creation by the Zimbabwean Parliament of the National Council for Higher Education, Solusi College submitted an application for establishment as a fully accredited private university. 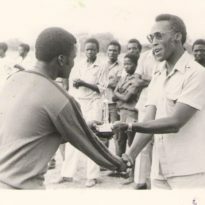 In March 1992, an on-site inspection by members of the National Council, and continuing dialogue of church and college administrators with the National Council and the Ministry of Higher Education led to the gazetting by government, in July 1994, of a charter establishing Solusi University. On May 4, 1995 in a colourful ceremony attended by hundreds of guests and visiting dignitaries, His Excellency, Cde Robert Gabriel Mugabe, officially presented the Solusi University Charter, and the instruments of authority to the newly installed Chancellor, Dr I.D. Raelly. 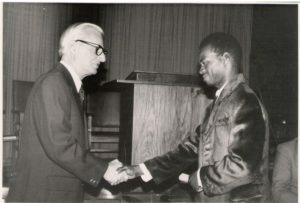 His Excellency then became the first graduate of Solusi University as recipient of the honorary degree of Doctor of Laws, in recognition for his personal and public commitment to education, his national and international leadership, and the Christian attributes so evident in his life of service. 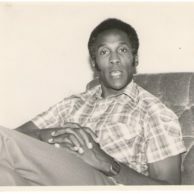 In a ceremony on 11 June 1995, at which Dr Ignatius Chombo, Minister of Higher Education, was the honoured guest, Solusi University celebrated its first graduation with seventeen graduates who had transferred from Andrews Degree Programme. In his graduation address Dr Chombo announced that the Solusi University students who are Zimbabwean citizen would, in the future, be eligible for government grants and loans to assist them in their education. With the establishment of Solusi University as a private university, the granting of Andrews University degrees on the Solusi campus was phased out in August 1998. However, it is expected that some form of linkage with Andrews University as a sister institution will continue for the mutual benefit of both universities. The fact that Solusi Mission has served Southern, Central and Eastern Africa is evidenced by the large number of graduates who hold responsible positions in all areas of leadership in business, government, and in the church. With the realization of the vision of being a “World Class Christian University” at hand, it seems certain that the positive influence of Solusi University will continue to expand throughout the region. Currently, the constituency of Solusi University is Zimbabwe Union Conference. However, students come from other countries such as Angola, Botswana, Lesotho, Madagascar, Malawi, Mozambique, Namibia, South Africa, Swaziland, Zambia, Democratic Republic of Congo (DRC), Egypt, Kenya, Rwanda and Tanzania.